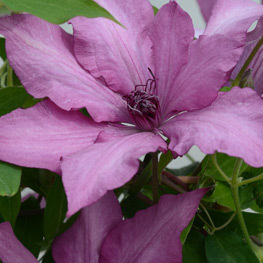 Donahues Greenhouse grows one of the largest selections of clematis in the country. Our staff has picked 4 of their current favorite varieties to feature. You will find these to be unique, beautiful and vigorous. Try one of these beauties! Chosen by our staff because of its unique coloring. Its silvery pink flowers are edged in purple making it stand out. 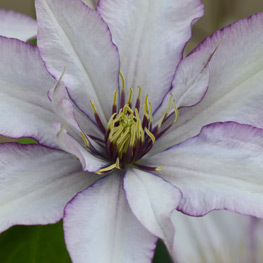 We have not seen anything like this in clematis until now! Chosen by our staff because it’s unique color presenting itself as both lavender and pink. It is a great repeat bloomer so will be enjoyed all summer in your garden! Chosen by our staff because of its strong blooming tendency. Grown in a large container this variety will bloom and bloom. It can be enjoyed in a patio pot or in your garden. 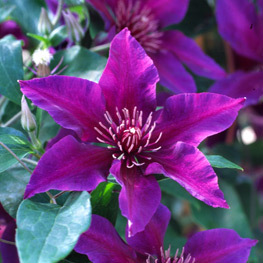 As one of the largest growers of clematis, we have a very extensive list of varieties that you can offer your customers. Located in Faribault, MN we ship small liner plants in 2.5” and 3.5” pots that you are able to grow on and finish. We also grow finished plants that can be shipped and sold immediately upon receipt. 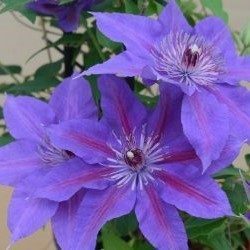 Wholesale customers click here for our current clematis availability.